are conducted in Iglehart Hall, the gymnasium at St. John’s College, King George Street in Annapolis, Maryland. During much of the school year, the club meets Tuesdays 6:30 p.m. to 8:00 p.m. and Saturdays 9:30 a.m. to 11:30 a.m. An additional student-led practice is held each week on Fridays 6:30 p.m. to 8:00 p.m. for the undergraduate competitive team. 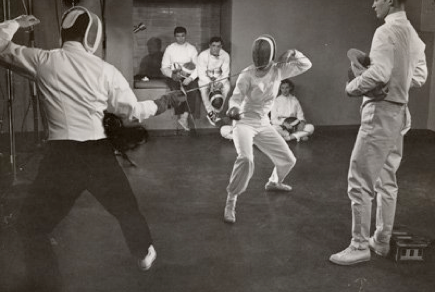 For town fencers (high school or older), floor time is available on Tuesdays and Saturdays. Starting September 2015, time for instruction, if available, is on Saturdays only. During the school year, the club follows the college academic calendar regarding holidays. For example, the club does not meet during Thanksgiving week or the Christmas holidays. The summer schedule is determined based on community interest at the end of the school year. There is no summer fencing in 2016. Community fencing will resume after Labor Day.